the Programme "Europe for Citizens"
The Municipality of San Leo, Lead Partner of the CENTRE project, organized a three days activity to introduce the main project issue such as the constitution of a bio-district, dealing with some of the themes connected to it: ecology, sustainable development, recycling, etc. It has been possible to discuss and learn through Learning By Doing experience on Urban Gardens and visit some interesting examples of farms and/or enterprises known at local/national level for their innovative solutions in the field concerned. This first meeting has been organized simultaneously to a Local Event, Festival “Torneo in Armatura” recalling the Renaissance at the Fortress of San Leo to foster active participation of Citizens and Tourists to project activities. The first day of event started at the Conference call at the Town Council with the welcome of Mayor of San Leo, Mauro Guerra and the speeches of Sauro Sarti of the Province of Rimini and expert in urban gardens Architect Massimo Bottini. The conference have been followed by a technical meeting related to the implementation of the project, in particular calendar of events, budget management, activities to be realized, dissemination and communication strategies etc. In the afternoon, the delegation left the Town Council to join the Fortress of San Leo and assist to the exhibition and performance organized for the Festival “Torneo in Armatura”. A guided tour to the Fortress and historical centre followed the exhibition. In the second day of the event, the agenda proposed three guided tours. The first one at IRCI SPA Systems and Energy, enterprise specialized in aquaponics facilities. Here it has been possible to get in touch with the innovative methods used by the enterprise to generate facilities in a sustainable ways. Later on, it has been organized a guided tour at Farm “Azienda Agricola Lazzi”, agricultural company with expertise on the production of energy from biogas livestock and business photovoltaic systems to produce a high quality milk. The event ended at Villa Olivucci of Alberto Olivucci, President of “Civiltà Contadina” (“rural culture”), www.civiltacontadina.it. Villa Olivucci is a unique reality; a house dating back to XVI century surrounded by a luxuriant nature cultivation of old vegetable varieties and coordinates the activities of the Association Kokopelli Italy for the conservation of biodiversity seed. In this singular place, the event concluded with an Open Forum on bio districts with testimonies of local actors on issues of ecology, sustainable development, recycling. 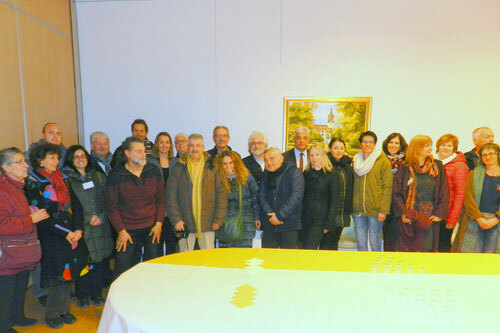 The second CENTRE meeting was held in Die (France) from the 22th to 24th of January 2016, during the XIV edition of the “Rencontres Ecologie au Quotidien”. The organization of the meeting during the well-known Festival gave a strong dissemination to the project not only to the local audience (citizens, volunteers, policy-makers etc...) but also to a huge number of participants/volunteers coming from different part of France and Europe. The CENTRE participants received a warm hospitality from the people responsible for the Festival and volunteers of the Association Ecologie au Quotidien, partner of the CENTRE project, which accompanied the group of participants during the 3 days. All participants, hosted by families, had to possibility to relate directly to local citizens, discover traditional habits and local culture, history and environment. The moments dedicated to lunch and dinner were a precious time to talk with families, volunteers, other participants and build interesting and fruitful ties with people. The first day of meeting (22/01/16) included a visit to the town of Die and the “Ancient Monastery of Sainte Croix”, founded in the 12th Century and located in the hilltop village. In the area of the Monastery, there are two hectares of green space including a botanic garden, a terraced garden and a wooden park with a great variety of trees. The old Monastery offers an ideal setting for trying delicious local specialities. During the afternoon, it was possible to visit ecological companies and organic farmers, in particular the associative Bio Grocer's shop and Nateva. Nateva is located in the Vercors Regional Nature Reserve, at the heart of the Biovallée and in the prime organic production area in France (Drôme Department). The laboratory is well placed as a production facility for transforming wild crafted and cultivated organic medicinal and aromatic plants. The Mayor of Die, Mr Gilbert Trémolet, and his staff, has concluded the first day with a meeting at the City Hall with a Welcoming ceremony. The second day of meeting (23/01/16) took place in another part of the Biovallée: Vallée de la Drôme. The programme included a presentation of the Biovallée association, the actors and elected representatives of the Biovallée in the Eco-Amphitheater “the Campus" of the Eco-Site of Eurre-26. In this occasion, all EU partners presented themselves and the project to the public audience. The presentation has been followed by three visits to an eco-construction, an organic pole and an organic farm. At the end of the day, CENTRE project and partner have been officially presented during the debate on the theme "To build together Innovative territories" at the Ecological Festival in Die. The debate was followed by the Opening ceremony of the 14th Festival of day-to-day ecology dedicated to the topic “Changer de vision” at the presence of Mayor, elected representatives, local actors and associations and public audience. In the last and third day of meeting (24/01/16) the programme included a visit to Saillans, a village managed by the inhabitants with a participative democracy and a visit to the local Market and eco-host “La lune en bouche” in Saint Andéol en Quint. The meeting ended after a final discussion between the CENTRE Partners on project’s activities and future collaborations. The third CENTRE meeting was held in Petrosino from 29th to 31st May 2016 named Symposium of Biological, a local event dedicated to the theme of biodistricts and most of all to the official signature of the first Sicilian biodistrict composed by 19 municipalities, called “Bioditretto – Terra degli Elimi” / "Biodistrict - Elimi's Land". The Municipality of Petrosino, promoter and Lead Partner of this cooperation, organized an official event inviting all municipalities participating to the Biodistrict. The municipalities are: Buseto Palizzolo, Calatafimi Segesta, Campobello di Mazara, Castellamare del Golfo, Castalvetrano, Favignana, Gibellina, Marsala, Trapani, Vita, Paceco, Pantelleria, Partanna, Petrosino, Poggioreale, Salaparuta, Salemi, Santa Ninfa, Valderice. The event opened on Sunday 29th May at the Multipurpose Center of Petrosino with a public conference called "Establishment of a Biodistrict in Sicily: opportunities and sustainable development". At the conference attended Gaspare Giacalone, Mayor of Petrosino, Antonello Cracolici, Regional Council for Agricolture, Antonio Ferrantino, President of the National Association Città del Bio, Alessandro Triantafyllidis, Manager of the Biodistrict AIAB, Giuseppe Spartà, Inspector Provincial Agriculture Department as well as Mayors of Biodistricts, Interparlamentar groups, representatives of Trade Associations and Organic Producers. The afternoon was dedicated to the theme "Biodistrict of Europe : comparing experiences" where the European delegations presented their territories, experiences and best practices connected to the theme of biodistricts. After the presentations, the programme continued with a technical meeting regarding the project activities. In this occasion CENTRE partners shared the results of the CENTRE survey realised among the different organizations on a sample of 265 interviewed. The survey gathered Citizens' opinions regarding the EU citizenship in particular their belonging to the EU, EU policies, the participation to democratic life, opinions on biodistricts and consumption of organic foods, the importance to promote sustainable development and in which aspects. The event continued on Monday 30th May with a tour of guided visits to organic farms, in particular participants had the opportunity to visit the oil farm "Titone" in Marausa, the wine company "Burgio Poggio Allegro" in Mazara del Vallo and crops and biological production " I Frutti del Sole" in Marsala. Since 1936, in a strip of land between Trapani and Marsala, the Titone family produces a high quality oil, good and natural. The company was one of the first in Sicily to convert to organic farming. Since 1992, all stages of production are controlled and certified. Today Titone company produces two types of oil obtained from olives harvested by hand and pressed few hours later in the company mill. The Titone family managed to create an oil that has inside the millenary flavors of this part of Sicily, gaining recognition around the world. "Burgio Poggio Allegro" is a wine company active from 1965, the family owner in one of the 7 most ancient families in Sicily. The last visit was organized at "I Frutti del Sole", an organic farm producer of fruits, vegetable and other products and promoter of a netowrk of organic farms in Sicily. They export in an international market. On the evening the second day event culminated with the proclamation of the first Bio-District with the signing of Articles of Association by all participating municipalities. The signing opened the doors to an active collaboration to create a sustainable economic and development plan for the protection of agriculture and landscape as a distinctive element of our identity. All participating municipalities are now part of a circuit that will allow them to build a network of cultural, natural and productive resources, for the Protection of the environment and local productions and for the enhancement of the authenticity of food products, wine and natural beauty. The purpose is to plan the future of the country and citizens in an enlightened way, focusing on ecosustainability and on the protection of environmental, historical and cultural heritage. The birth of biodistrict has been celebrated with a public concert of classical music called "Organic Spring" played by the Orchestra of the Conservatory “A. Scontrino” of Trapani, and directed by the choral director Paolo Morana. The third and last day the Symposium of biological ended with a session dedicated to "Biodistrict - agricolture and sustainable development" with the participation of Luca Badalucco, Assessor of Agricolture the Municipality of Petrosino and the Mayor of Petrosino, Gaspare Giacalone. The Transnational Meeting in Cyprus aimed in the further awareness of the consortium about the impact of Bio-Districts in the Territorial Renaissance especially in Rural areas. It took place during the Aromatic & Healing Herbs of Cyprus Conference and Exhibition and the Rialto World Music Festival, and a separate Conference was organized about Bio-Districts. On the 22nd of July the delegates arrived in Cyprus and had a networking dinner at the President of the Community Council with a group of young musicians who were hosted for the World Music Festival and have entertained them creating an atmosphere of cooperation and happiness. On Saturday 23th of July the delegates participated in the Guided Herbal walk organized by the Cyprus Herb Society and got to know the resort and the healing herbs of the area and later attended the Herbal Exhibition, where 40 bio- producers were selling their products from gastronomy to beauty and arts & crafts. In the evening the event continued with the Rialto World Music Festival at the Cultural Center. On Sunday 24th of July a guided Hiking at Kaleidonia Waterfall and Eco-path have been organized to experience the potential of eco-paths for tourism & development and attend a concert in the waterfall which was a very unique experience. Lunch followed at the Trout Farm and in the afternoon the event continued with the Herbal Conference & Exhibition at the Cultural Center with the following program -Herbs to Reduce Stress- Herbs & Your Memory- How to Treat Diabetes with Herbal Remedies- Herbs for High Blood Pressure- Aroma & Emotions. On Monday 25th of July the event ended with a Meeting among CENTRE Partners to assess the transnational meeting in Platres and to plan the following transnational meeting in Berovo. A Trip to Limassol followed with a City Orientation, a visit to Medieval Limassol & Marina, Lunch at old market square and a visit to the offices of Cyprus Tourism Organisation and the new Marina of Limassol. The official opening of the meeting has been held in the Business Incubator of Berovo where the public audience and European delegations have been welcomed by the Mayor of the Municipality of Berovo Dragi Nagjinski. The first part of the conference included a short presentation about the city of Berovo and its surroundings and of the CENTRE Partners. The second part of the conference has been dedicated to the presentations of Healthy Food Zegin by Elizabeta Markoska and of the Agency for financial support of agriculture and rural development. At the end of the conference, the meeting continued with the officially open of the Etno Square Festival, an international festival organised every year in Berovo that hosts international artists with the aim to create a fusion of different cultures and traditions. The Festival includes a big market exhibition with a variety of traditional food, such as cheese, dairy products, processing of forest fruit, honey and other bee products as well as handicrafts from wool and cotton, ceramics, glass, textiles, specialties of Macedonian regions. The second day the programme continued with a cultural visit to the Monastery of St. Arhangel and Michail , first monastery church in Berovo and the Museum of Berovo that displays Malesh items, costumes, documents and objects. The visit continued to the Berovo Lake. One of the biggest dams in the form of an arch in the Republic of Macedonia, where there are flat peaks and meadows with flowers, forest fruits and many herbs for medicine and tea. The meeting continued the third and last day with two visits to the Agromax, for the Eco production of dehydrated fruit and vegetable products and to the Public Enterprise “Maleshevo”, for the Eco production of essential oils. The event ended with a steering committee among partners regarding next project activities and future cooperation projects. The event officially started on Friday morning with the presentation of CENTRE project and European delegations to the audience at the Town Hall of Hranice. The mayor of Hranice municipality, Mr. Jiří Kudláček welcome the participants before giving the floor to representatives of each project partner who presented their territories and good practices. The conference has been followed by a visit of Farmers market in the main square in Hranice. In the afternoon the Programme continued with a visit of historical town center (church, synagogue,) and Hranice castle, tower of old townhall. The day ended with an organized social dinner with representatives of municipality, local stakeholders, farmers. The event continued on Saturday morning with a visit to local farmers, in particular to: Eduard Kozák - ovocnářstí – they grow fruit, produce dry fruit, regional fruit stums/juice farm www.ceskejablko.cz; small EKO farm called“Goat Castle”, which is located in Hustopeče nad Bečvou, close to Hranice. They breed goats, cows and produce products from milk – cheese, yogurts, cottage cheese, milk; Then Agriculture farm in Partutovice (http://www.zdpartutovice.cz). Where they breed cows and grow potatoes. Visit started with tasting their products – cake made from potatoes - very special local product. The visits have been followed by a lunch in Bělotín municipality, at local school, and the lunch was prepared by company Scolarest – as an example of health school dinning with using local products ( http://skoly.scolarest.cz/Pages/Anonym/Info.aspx?lang=en). The visit ended in Teplice nad Bečvou, and Spa Lázně Teplice nad Bečvou and walk to the centre of Hranice. The programme continued in the evening with a technical project meeting about the project reporting and final activities, as well as future cooperation. This session has been followed by one dedicated to the discussion of the constitution of European network of biodistricts. A draft manifesto has been shared among partners to starting define a common model. A final presentation of the concept of biodistricts from each partner territories concluded this debate. The day ended with a social dinner of regional products. The third and last day was organized visit to Spa area and Zbrašovské aragonitové jeskyně (aragonite caves) in Teplice nad Bečvou which is the most warm caves in Czech Republic. The common temperature is 14 oC. This visit was organised before the official conclusion of the final event. Les personnes intéressées pour participer à un voyage dans le cadre du projet européen "CENTRE : Création d'un Réseau de Biodistricts Européens afin de parvenir à une Réelle Renaissance des Territoires" peuvent nous contacter pour plus d'information. Programme des 3 Jours d'accueil des Biodistricts européen à Die et dans la Biovallée du 21 au 23 janvier 2016. 19h Diner in the Salle Polyvalente with the hosts and the Volunteers organising the festival. 14h : Welcome in the Salle Polyvalente Bd du Ballon in Die and linking with the hosts. Morning and afternoon : Visit of ecological companies and organic farmers in Die or participation to the conference s of the Festival. After : Going to sleep or at 20h30 participate to a Theatralized conference " the world is changing and us?" 22h30 A concert of Neapolitan folk songs "Neapolis"
16h30 : Film on the Biovalley-Drôme - Presentation of the CENTRE partners and the actors, elected representatives in the Ecological Festival in Die and debate on the theme" to build together Innovative territories" with the public. 9h Discovery/explanation about the river Drôme in Saillans, a village managed by the inhabitants with a participative democracy. Visit of the local Market. Claudia Imola, Tourism Office of San Leo. Giulia Allegrucci, Fin Project. 21/01/2016 intorno alle ore 12,00 at Marseille / departure 24/01/2016 in the morning. Friday 22nd January we will travel by train to Valence and then to Die. So I will just check the time of the trains and I guess we will be at your place before noon :-) Unfortunately the flight back on Sunday is already at 13:25 from Lyon. leave in the morning. - Testimonies of local actors in the issues of ecology, sustainable development, recycling, etc. - Transfer from Pietracuta to the Rimini station / Rimini airport. 2) Do you know what the European Union does for its citizens? Savez-vous ce que fait l’Union Européenne pour ses citoyens ? 3) Do you actively participate to the democratic life ? Participez-vous activement à la vie démocratique ? ● YES/OUI If so, how?/ Si oui, comment ? 6) What aspects of sustainable development should have priority (maximum 2) ? A votre avis, quels aspects du développement durable devraient être prioritaires ? The project « CENTRE - Creating a European Network of Bio-Districts to achieve a True Territorial REnaissance » was funded with the support of the European Union under the Programme "Europe for Citizens"